Manchester residents have been asked to check household appliances for recalled items following a rise in fires involving tumble dryers. Since January this year, Greater Manchester Fire and Rescue Service (GMFRS) has attended 43 fires involving tumble dryers in Greater Manchester – an increase of nine (26 per cent) from the same period in 2015. Not all of these involved recalled items, however, at least eight incidents since the start of 2016 have done so. A number of appliances have appeared on recalled lists in recent months, including items from Hotpoint, Indesit, Creda, Swan and Proline tumble dryers. 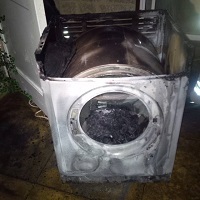 Most recently, firefighters attended a fire involving a recalledIndesit tumble dryer in Wythenshawe and are urging residents to stay safe at home by checking their appliances. Watch Manager Tony Harrison, from Wythenshawe Community Fire Station, was in charge of the incident. He said: “The tumble dryer involved in the fire was plugged in to the mains but not switched on when it set alight. GMFRS wants to highlight this incident as a reminder to the people of Greater Manchester about risks connected with tumble dryers and keep them safe at home. Chairman of Greater Manchester Fire and Rescue Authority, Cllr David Acton, said: “Tumble dryers have been around for a long time and used safely they can be a useful addition to your household. However, if fluff is allowed to accumulate in the filter, near blocked vents, and at the rear of your dryer you increase the risk of this fluff catching fire from the heat created by the dryer. “Following the recent spike in tumble dryer fires in Greater Manchester we want to urge people to check their appliances against the Electrical Safety Council’s recalled products list and follow our safety advice, which includes removing lint regularly, not covering the vent and vacuuming areas around the dryer to prevent build-up of fluff.